When we were pregnant with Reaghan we immersed ourselves in everything we could find to educate us on this new experience we were embarking on. One of the first questions I had was "how do I take care of my body during pregnancy?" It seemed like there was a lot of misleading information out there on the subject. I quickly learned that one of the most important aspects of a healthy pregnancy, our nutrition, was really under-emphasized in our culture. Nutrition plays a major role in the health of your pregnancy, development of your baby, and even the outcome of labor and delivery. Since we seem to hear mantra's often as pregnant mama's such as "don't worry, you're eating for two!" or "stay away from salt or you will swell!" 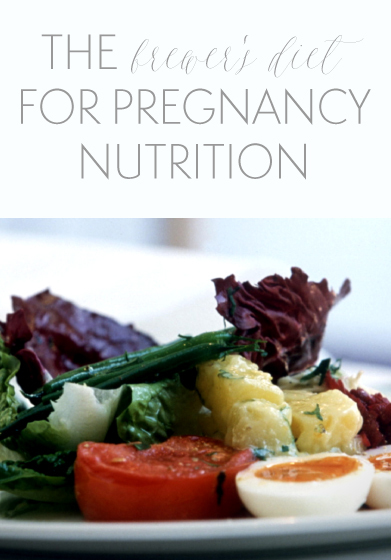 I think there can be a lot of confusion surrounding pregnancy nutrition. During our very first appointment with our midwife (the same one we're using for this pregnancy!) we learned about the role nutrition plays in pregnancy and birth! She and our Bradley Birth Instructor highly recommended the Brewer's Diet, which is what I follow during pregnancy. It should be noted that I am NOT a doctor, nor a midwife, or anything of the sort. Like anything, you should always do your own research and make the best decision based on your specific situation. I have thankfully had two very normal and healthy pregnancies, so this information is based on that, not one with complications, history of health concerns, etc. Milk or dairy product, 4 servings. Examples: Greek yogurt, string cheese, raw cheese, raw milk or regular milk, cottage cheese. Eggs, 2 servings. Can be eaten any way. Protein, 6-8 servings. Examples: beef, lamb, pork, liver, chicken, turkey, canned tuna (chunk light has less mercury than albacore) or salmon, sardines, nuts, almond or other nut butters, beans, brown rice, buckwheat or bulgar wheat, seeds. *Eggs and dairy can also be considered good choices for protein, so check labels on your dairy products like Greek yogurt, which is higher in protein than other yogurt choices. Just don't "double dip" when counting servings, you need 6-8 protein and 4 additional dairy servings. Dark green vegetables, 2 servings. Examples: broccoli, spinach, chard, kale, brussel sprouts, asparagus. Vitamin C, 2 servings. grapefruit, tomatoes, cantaloupe, oranges, lime, strawberries. Fats and oils, 2 servings. Examples: grass fed butter (my favorite is Kerrygold brand! ), extra virgin olive oil, coconut oil, avocado, almond butter or nut butters. Vitamin A, 1 serving. Examples: carrots, cantaloupe, winter squash, potato. Water, drink to thirst. My midwife says to drink half your body weight in ounces of water. For me that's about 75 ounces so filling up my 24 ounce travel water bottle up about 3-4 times a day. Of course this varies with how I'm feeling and if I'm sweating more during the summer. It sounds like a lot, but I promise it's totally doable! I know I'm not used to tracking what I eat or thinking much about the different nutrients each serving of food contains. My midwife offers a meal diary sheet that is helpful to gain a clear picture of whether or not I am really getting all that I need in a day. However, I needed something a little bit more comprehensive to help me keep track, so I created a worksheet I can print off weekly to check off servings as I eat them! I of course indulge in a milkshake every now and then, and definitely don't believe in depriving myself, but also try to remember that if I'm having a huge craving for sweets (or something else unhealthy), it probably means I'm not getting enough protein or some nutrients are low somewhere in my diet. It makes me dig a little bit deeper to figure out what might be causing that rather than chalking it up to "pregnancy cravings." If you want to find out what cravings signal which nutrients you need, I found this list helpful. I love this diet and really feel great when I'm eating this way... what do you think of the Brewer's diet?